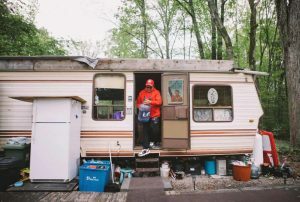 Twice a week, Iokarenhtha Thomas and her husband grab jugs, pails, and whatever other containers they can find, and drive 5 miles to the nearest public water tap so they can cook, clean and bathe. The water isn’t potable though, so once a week they also drive 6 miles to the nearest town to buy bottled drinking water. 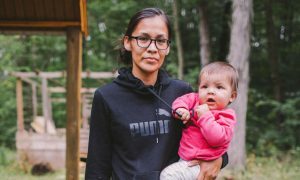 A university student and mother of 5, Thomas lives at Six Nations of the Grand River indigenous reserve. She’s been without running water since age 16. Her children have never known what its like to have a shower, bath or toilet. Meanwhile Nestlé extracts up to a million gallons of fresh, sparkling water a day from a well on her peoples’ treaty land. “When my husband isn’t here, it makes it difficult to do the dishes or anything because I don’t have the strength to carry all the jugs of water,” Thomas told The Guardian. Each container of store-bought bottled water weighs more than 40 pounds. A little over a year ago, she tried supplementing with rainwater collected from her rooftop, but stopped when her son was diagnosed with rashes called impetigo, believed to be caused by bacteria on the roof’s shingles. Some of her neighbors have paid thousand dollars to be connected to a community well only to find the water was too polluted to drink because of sewage contamination from septic beds. One neighbor lamented to The Guardian about how drought has dried up all the wetlands in the community in recent years, decimating local populations of salmon, trout, pike and pickerel. In 2013, the community received a $41 million grant to build a state-of-the-art water treatment plant, but because the grant did not cover the cost of plumbing, fewer than 10% of homes are connected to it. The 90 percent either have no water at all or tap water that’s too polluted to drink. Meanwhile Nestle pumps massive amounts of spring water from a nearby well known as the Erin Well, which sits on a tract of land given to the Six Nations under the 1701 Nanfan Treaty on expired permits. The company pays the province of Ontario only $390 per million liters for the water, while paying Six Nations nothing. 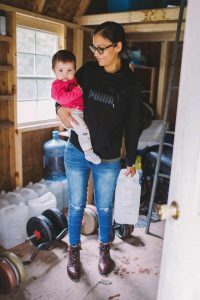 There are currently 50 indigenous communities in Canada with long-term boil water advisories, which means an estimated 63,000 people haven’t had drinkable water for at least a year, some for decades. The lack of water has been linked to health issues, including hepatitis A, gastroenteritis, giardia lamblia (“beaver fever”), scabies, ringworm and acne. Canada is home to 60% of the world’s lakes and a fifth of the world’s fresh water, making it an attractive target for beverage brands such as Aquafina, Dasani and Nestlé, the world’s biggest bottler. 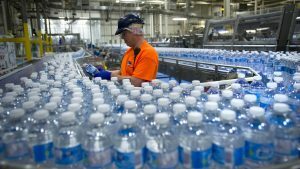 According to The Natural Resources Transfer Act, provinces have the right to sell their water to whomever they want, including companies like Nestlé. But according to the Canadian constitution, the federal government has a “duty to accommodate and consult” First Nations when any natural resource is extracted from indigenous land. So, Six Nations is now suing the province and calling on people worldwide to boycott Nestlé and all its affiliate brands, including Arrowhead, Poland Spring, Deer Park, Ozarka, Zephyrhills, Acqua Panna, San Pellegrino, Perrier, Vittel and Buxton. While some bottled water companies filter tap water, Nestlé was founded on the idea that spring water had incredible health benefits. Nestlé water comes from deep aquifers and natural springs, which can take decades or longer to replenish, according to Peter Gleick, author of Bottled and Sold: The Story Behind Our Obsession with Bottled Water . For the past century, demand for freshwater has grown twice as fast as population growth, explained Steven Solomon, author of Water: The Epic Struggle for Wealth, Power, and Civilization . The United Nations predicts that by 2025, nearly 2 billion people will live with dire water shortages, while two-thirds of the world’s population could be living under stressed water conditions. That means a race to find untapped springs. Anticipating shortages, companies like Nestlé are trying to lock in as much of the world’s water as possible, Solomon says. “One perspective – which I would call extreme – is that water should be declared a human right … The other view is that water is a grocery product. And just as every other product, it should have a market value,” said former Nestlé CEO Peter Brabeck-Letmathe in a 2005 documentary.